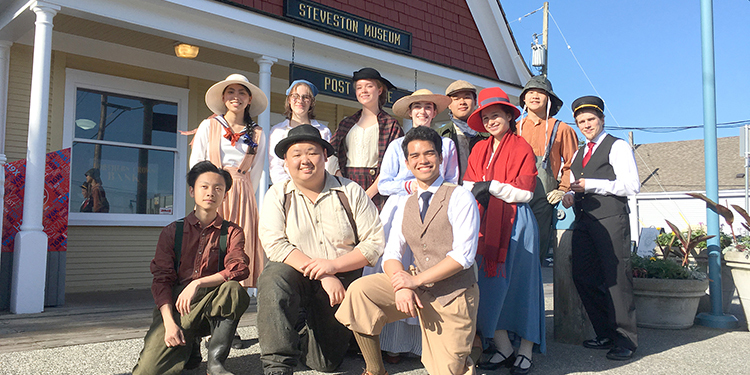 Student actors from McRoberts secondary portray eight characters from 1917 Steveston. Multiculturalism may be a modern buzzword, but it has been a reality since the arrival of the first settlers. During the community’s formative years over a century ago, folks from throughout the world contributed unique customs and traditions that helped to shape their new home. With immigration, many cultures joined the Musqueam already here since before written history. The blending of nations offered many challenges and opportunities, of which we catch a glimpse thanks to the student actors. Portraying Oillie’s sibling Mika, Caroline Tang says it’s nice to see more of Steveston than meets the eye. “There’s so much history that’s interesting, and the vignettes bring out the interesting quirks you probably wouldn’t notice just walking around,” she says. “I thought women then were a little more soft spoken and shy,” Tang says. This is the second year the young actors have been a part of the walking tour vignettes. Their drama teacher encouraged them to try out. But while Bernales had considerable on-stage experience since Grade 8, Tang worked mostly back stage before emerging from the shadows. Now, although both have chosen very different career paths—Bernales will be studying bio-medical engineering and Tang biology with the intent of becoming a teacher—they can’t imagine their lives going forward won’t also include acting. Written (alongside a heritage advisor) and directed by award-winning playwright and McRoberts alumni Andrew Wade. He plays the conductor. The historical vignettes use actual locations as settings for each brief play, buildings that were here in 1917. The Steveston Alive! WalkingTour Vignettes are performed Saturdays at 1 and 3 p.m. in June and July, and are about an hour long and just over a kilometre in length. Tickets are $10, and free to kids 12 and under. The program is made possible through the support of GF Financial and the City of Richmond. For information visit richmond.ca/stevestonmuseum.